Alright, tonight I'm ready to go. It's amazing what a little Mexican food can do for the soul. I just wish I had a few more hours in a day to create. A few days ago I posted a picture of a hanging snowman. 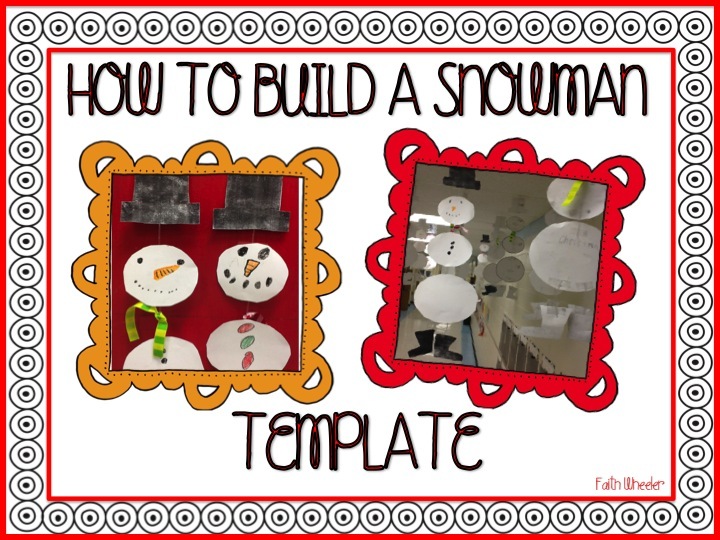 I loved the snowman and couldn't wait to turn it into a craft and a new writing activity. I looked in several places on Pinterest to see where the snowman may have originated, but every time I found it, it just took me to a picture. I googled it and searched the images, but still no luck. 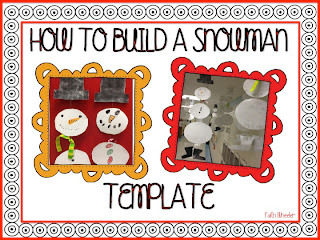 So, since I couldn't figure it out I created a template because to make this snowman with your kiddos, it is definitely needed. Here are pictures of how our snowmen turned out. If you like it, please feel free to click HERE and download the template. 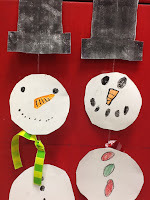 The kids LOVED making them and I can honestly say it was one of the easiest crafts I've done. 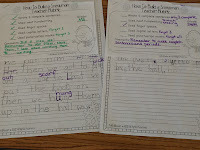 After we finished, we did a writing activity that included rubrics, questions, and everything. After the rough drafts were done, my SPED teacher, TA, and I were trying to figure out how we should fill out the rubrics. We finally decided that we should do them based off the rough drafts. Before they had started, I went over what we were going to be checking. 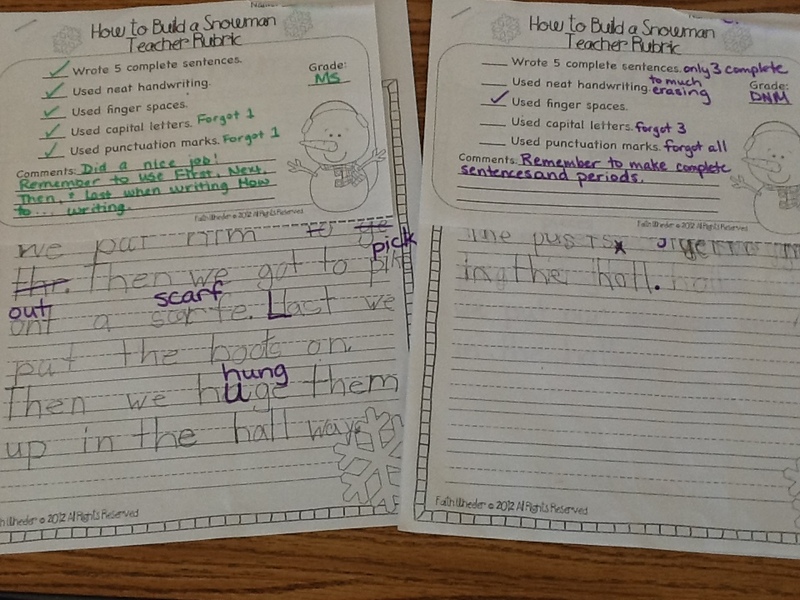 Honestly, most of the grades were In Progress grades, but I think it was good for us to see what we needed to work on and I think it really clicked with my kids that we were serious about their writing. 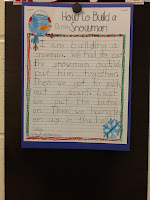 I would have loved to have graded based off their final drafts, but we knew all of the mistakes would be fixed by then. 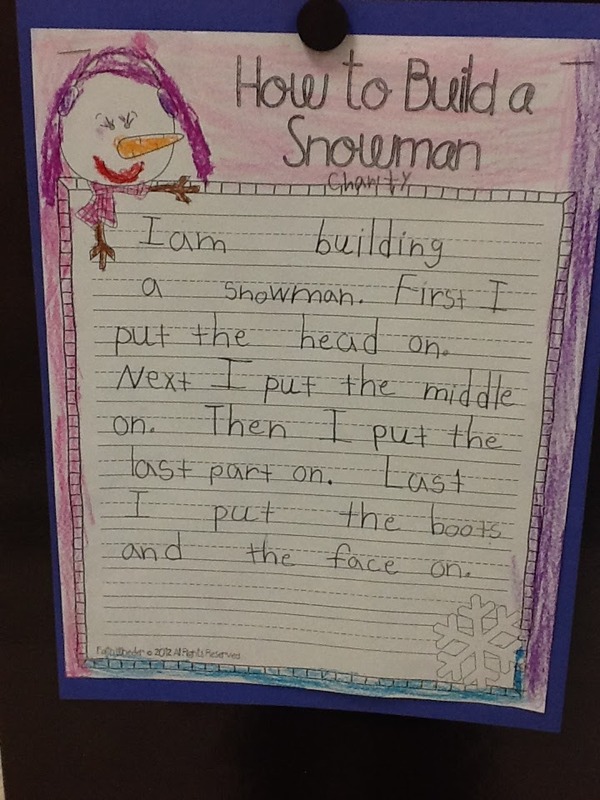 Anyway, if you need a good writing activity, click HERE to get the writing activity that goes with the snowman template above. Last thing, I was in a hurry today with Disney. I had a PTO board meeting at 4:00, so I had to think fast. 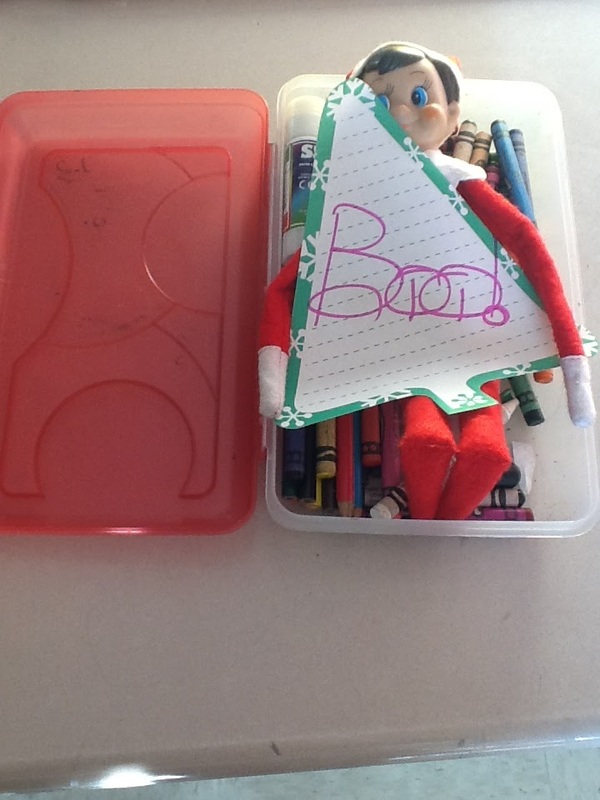 I ended up coming up with sticking him in a pencil box with a note that said, "Boo!" I figured that would make my kids laugh. I purposefully picked a child that isn't usually first in the room. If your classroom is like mine, your kids come in at the same time every day. I always feel bad that my first child is the first child every day, so no one else ever sees the elf first. So, tomorrow, one of my sweet little girls will go to start her morning work and discover a sneaky, little elf in her pencil box. Oh, and for my kiddos that turn in homework - it will be homemade chocolate chip cookies. Just pray that I don't hit the alarm 10 times in the morning. Also, pray I don't burn them. I'm the girl who can't bake cookies... paint for 40 hours in a week - easy. Baking cookies is a whole other story! Cookie tip. Buy a half sheet cake pan from a restaurant supply store and use parchment paper. Perfect cookies every time! 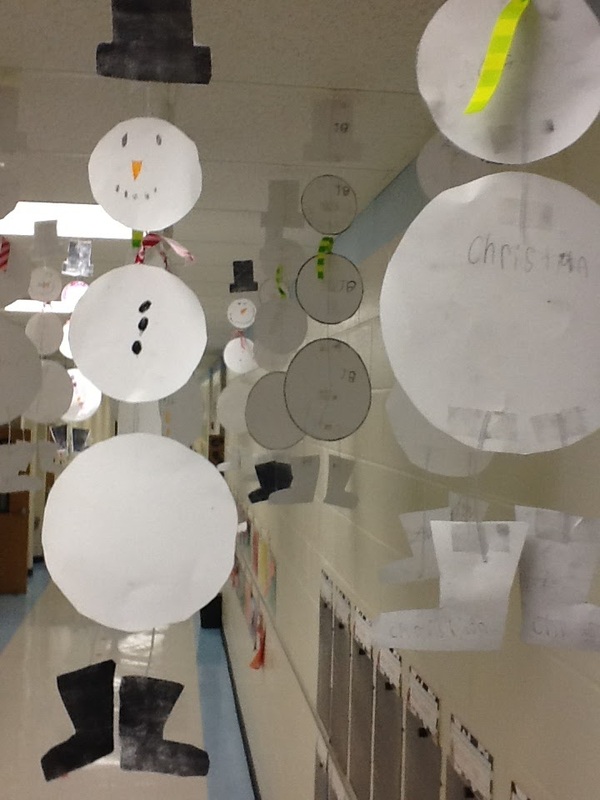 Love your hanging snowmen! We aren't allowed to hang anything from our ceiling, so I'm jealous you can! I love the snowman set - thank you!! And the cookie tip is spot on - I use parchment paper for all my baking. Glad you can use it :) Several of my teammates are planning to do it, too. 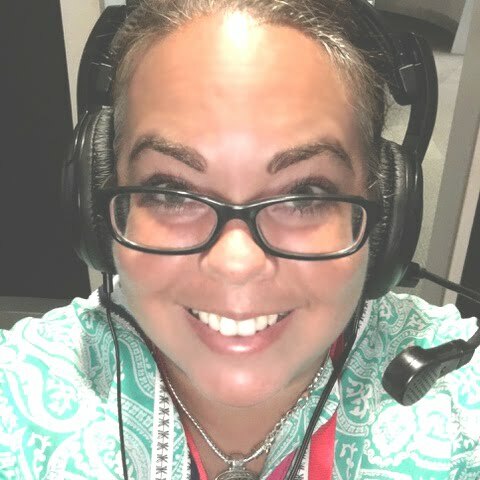 LWML is hosting a fun linky! No problem :) Glad you like it! 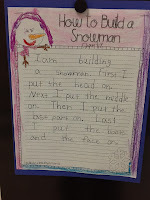 Faith, I love your rubrics for the snowman writing. I made a modified version of this for my second grades except we did hot chocolate. It really helped seeing how you had it all set up. Thanks so much for sharing!! I am your newest follower!